The designers of this game are always looking to expand their roster of traits, and that means that sometimes, we get traits are just briefly mentioned in the original novels. One of these are the Woodmen of Mirkwood, that recently got a synergy despite being around since the days of the Ringmaker cycle. In this article, we will go over some of the characteristics of the trait, and what cards you should definitely run in your Woodmen decks. 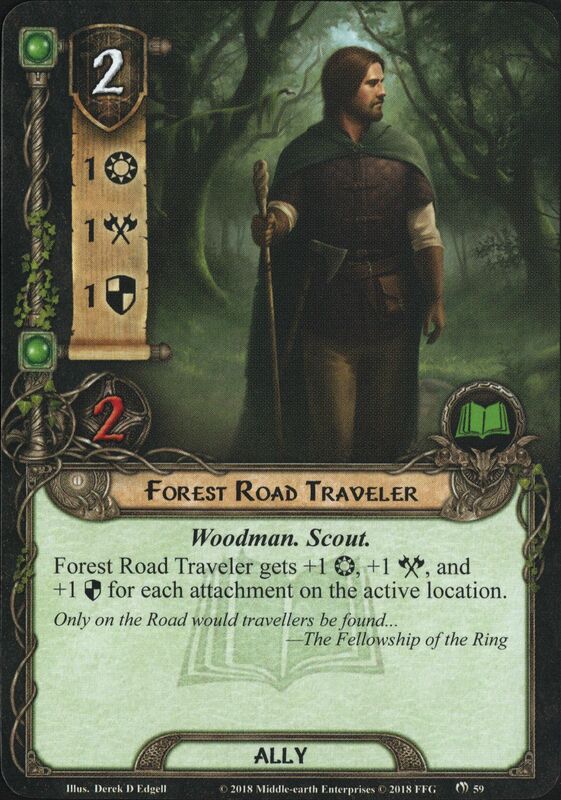 The Woodmen are a sub-species of men that live between the river Anduin and the Mirkwood Forest. They are the ones responsible for cutting down the East Bight for their fires, and generally don’t get caught up with the matters of the world. They have a good relation with the Beornings and help them defend the Anduin Vale. They are renowned archers and are the main reason why the eagles of the Misty Mountains don’t fly further east. Like some other traits (Eagles for example) the Woodmen trait is wholly contained in one sphere, Lore. All the Hero and ally cards are in this sphere, and you can easily find supporting cards from this sphere as well. A mono-Lore sphere will allow you to pay more easily for the slightly overpriced allies and keep control of the board while keeping a relatively low threat as well. The Woodmen deck is centred around location control through various means. In the early days (before Wilds of Rhovanion) the Woodmen allies tended to clear locations through either making progress by themselves (Mirkwood Explorer) or to clear duplicate copies of locations that clogged up the staging area (Eryn Galen Settler). These allies by themselves were pretty useful in getting rid of locations, but they still missed a cohesive synergy with each other. This came in the form of the Ered Mithrin cycle, where a good chunk of the Lore cards brought more allies and attachments that could go on locations in the staging area. These attachments would either help with reducing the problem that the location posed (Woodmen’s Path) or would reward the players for exploring the location (Woodmen’s Clearing). This also made older location attachments better and returned some out of my binder (namely Guarded Ceaselessly). There are two approaches to the Woodmen Attachment synergy. Either you pile all attachments on one location and use South Away for a massive drop in threat on top of the rewards you get from clearing said location. Or you spread out your attachments, making sure that you always have a location to travel to so that Haldan doesn’t exhaust to quest. Both synergies have their merits and their accompanying cards. Stock all attachments on one location and Mirkwood Hunter might become a free ally. On top of that, any Forest Road Travellers you have will have insane stats that will come in handy for the next combat phase. There is a downside to this though, once the active location has been explored, you lose a lot of these attachments, and will have to draw new ones, or use an Erebor Hammersmith to return discarded copies. The spread out version might not be as flashy, but it will serve the group better in a location lock situation. With this, you will always have a good travel destination and you can use Familiar Lands to lower the threat of each location with an attachment by 2. This helps to overcome the problem of having so many locations in the staging area, but it will lower the effectiveness of your allies. There are few real traits that work together with the Woodmen trait since it is quite a new trait to be fleshed out. However, the location control aspect of this faction makes it match easily with the Scout trait. This trait is rooted in the Spirit sphere and will make questing and location control even easier. Having access to Spirit and the Scouts allows you to play Scouting Party, as well as older location attachments such as Thror’s Key, Ancient Mathom, and Power in the Earth (for whatever that’s worth). A good balance between these traits and their spheres will make for a strong location control deck that will come in handy in numerous 4 player games. When going over the Woodmen trait, you can see that some of their cards are stronger than others. 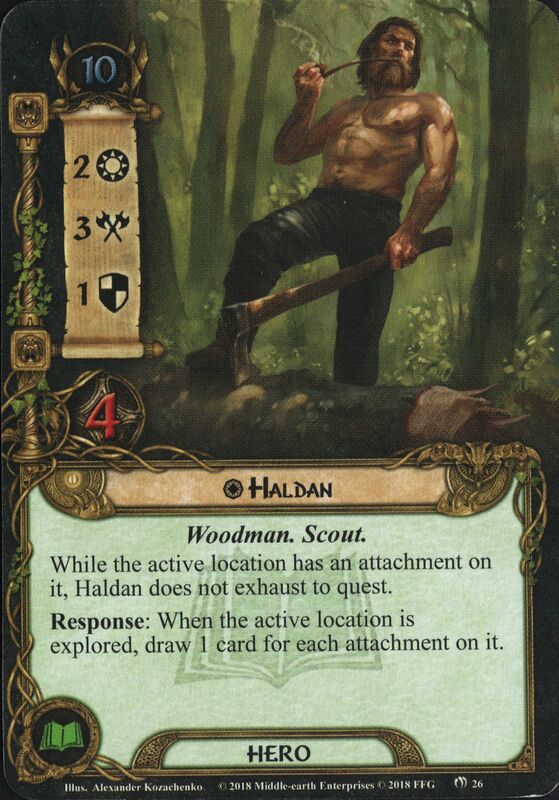 One such card is Haldan, the only Woodmen hero up to this point. He benefits from the active location having an attachment by not exhausting to quest. This leaves you with Haldan left standing. You can then use him for combat, as he has a healthy 3 attack, which is not common for Lore heroes. If no enemy has been revealed for him to use his attack on, you can also exhaust Haldan in combination with Guarded Ceaselessly so that Haldan can quest for 4. This is allowed through Haldan’s Scout trait, which is quite useful if you build around him. As a Lore hero, Haldan also fills the role of your card draw engine, though you will need to have enough attachments for locations in your deck. But if you do, then you get to draw 1 card per attachment on the active location after it gets explored. This is a very solid card draw engine in specific scenarios where locations can have encounter attachments, but also if you include plenty of attachments in your deck. He does not go into every deck, but if you build around him, he can be pretty solid. Speaking of attachments, I will also include the two Woodmen-titled attachments in this category, the Clearing and the Path. 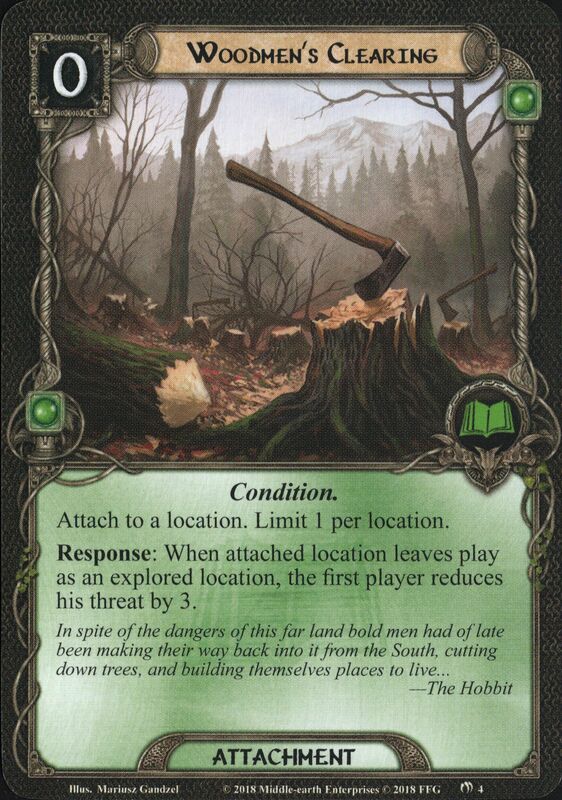 The Clearing is Lore’s first real threat reduction card, and it is very much worthwhile to add it in every Lore deck you have. The attachment is free and can attach to any location in play. If that location is explored, the first player gets to lower their threat by 3. For a free card, this effect is just simply amazing and will be appreciated in a multiplayer game. In solo, it tends to be more effective for yourself, as you are always the first player, so you always get to lower your threat. Think of this one as an Ancient Mathom, but with threat reduction instead of card draw (though with Haldan in play, you still draw the card). The Woodmen’s Path verges into game-breaking territory by attaching to any location with no progress on it yet. Then, if ever that location becomes the active location, its quest point value gets reduced to 1. Not only does this negate the +1 quest point from Elf-stone, but it also can neuter a terrifying location with 8+ quest points that would otherwise take forever to clear. Think about the Great Hall during Treachery of Rhudaur, or Dreadful Gap in the Dwarrowdelf cycle. Of course, you still need to travel to the location, but once you do, any progress on it will clear the location. 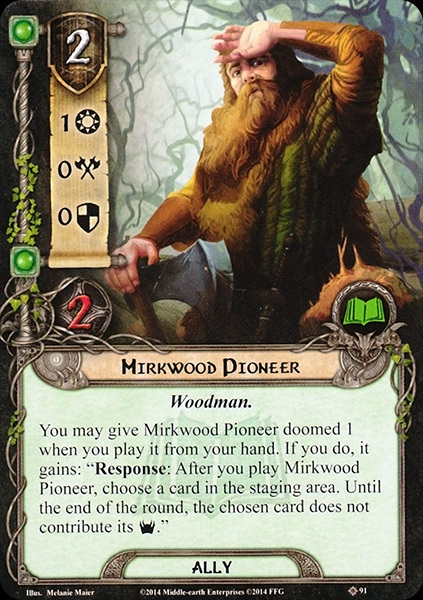 With so few cards in the synergy at the moment, there aren’t really any rotten apples in the Woodmen trait, except for one: the earliest. may have been the Pioneer of the trait, but it has not aged well. Its effect is still sort-of in line with the location control cards in this trait, but having just a one time effect that hurts the group in their threat tends to push him into the binder. 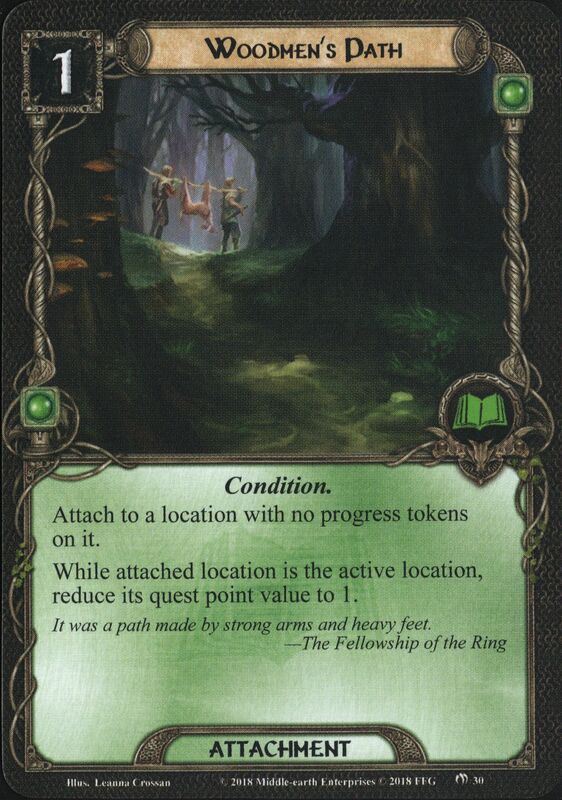 While he is more versatile in his effect than Radagast’s Cunning or Secret Paths, I would much rather prefer those events over this guy, as they can react to cards that were just revealed during the turn, and are cheaper than this ally who is next to useless after he has done his trick. He may have a place in a Doomed deck, but not in a general Woodmen deck. With this being the latest addition to the traits of the game, the decks are still developing around the synergy and will have to be updated once the cycle concludes. In the meantime, here are some decks that use the Woodmen trait to some degree. This concludes the first trait of February that is to be covered. I will update the article should any new player cards for the synergy appear in the final half of this cycle, but I doubt it will be ground breaking (I hope to be wrong). In the meantime, I will start to go over the traits that have had some development during this cycle, trying to conclude all traits by the end of the month. Next time will have a reupload of the Beorning trait.